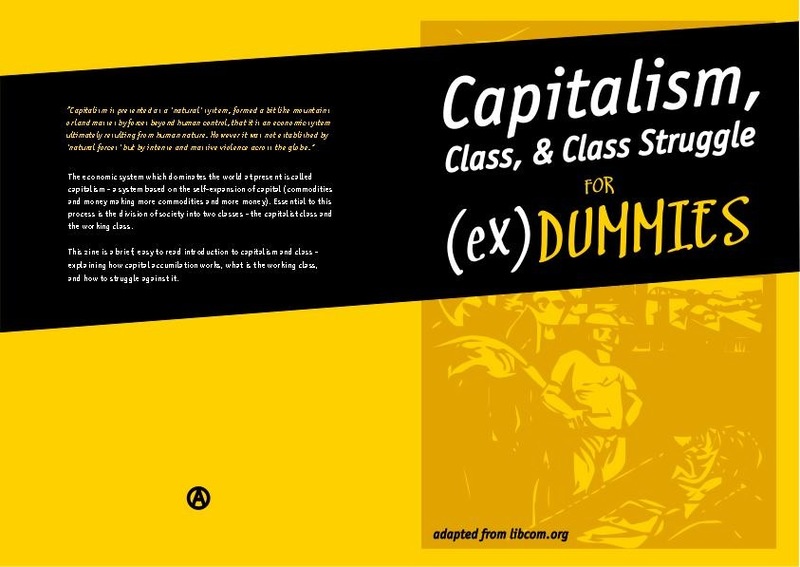 A brief introduction to capitalism, class, and class struggle. Downloadable, ready-to-print PDF adapted from libcom.org's introductions. Includes graphics. *a section on unwaged work has been added. I just noticed a typo from the original: people who resisted imposition of wage labour suffering "deprecation" as opposed to "deportation". Sorry about that! But thanks for doing this, it looks great. Any chance of doing an alternate version with the pages in consecutive order, for online reading and uploading that here as well? I think this is really good. Would be good in print, perhaps with a couple more sections as 8 pages would make it a bit thin to sell. Yeah, we're still working on other sections.. so far we've only got the intro to direct action as well.. planning one on unions soon! @ Steven: gutted I missed that too! I'll change and reload? And happy to work with people to add sections in the future. Just PM me. Eagerly waiting for the typo to be fixed so I can print some out. Really nice work! Just edited it and have uploaded. Waiting on the mods to ok it, then it's good to go. Will do a web one also. In a world where everything is for sale, we all need something to sell in order to buy the things we need. Those of us with nothing to sell except our ability to work have to sell this ability to those who own the factories, offices, etc. And of course, the things we produce at work aren't ours, they belong to our bosses. much more than necessary to keep us going as workers. The wages we get roughly match the cost of the products necessary to keep us alive and able to work each day (which is why, at the end of each month, our bank balance rarely looks that different to the month before). The difference between the wages we are paid and the value we create is how capital is accumulated, or profit is made. which sounds odd. What does it mean? We prepare a Slovak version of the text and have a hard time translating it so that it makes sense in the whole context of the paragraphs. Thanks for help in advance. Basically it is saying that we produce more in a day than is needed to reproduce our labour (i.e. stay alive and able to come to work again the next day). You see what we mean? Thanks for translating this, please let us know when it is done! yes, that is clear from all the other sentences except the one in bold;) anyway, thanks for clarification. the text will be published within a month I guess. there is a typo in the last sentence on the back cover - accumilation. also, it sounds as though you are saying "how to struggle against working class", not capitalism, since the last noun before "it" is "the working class". Hey, would you be able to post that up here in our library in our Slovak language section? With the title and an introductory paragraph translated? that would be great, we would really appreciate it!